emmatree: We got snow! & please excuse my silliness, but it's east Texas and we got snow!!! We got snow! & please excuse my silliness, but it's east Texas and we got snow!!! Not a sight I thought I would ever see here in NE Texas. But I have a 4WD and the ever-wonderful Michael doesn't. all the way to his house in the snow. Which meant me to the rescue. Which meant I got to see this. Something else I also thought I'd never see. 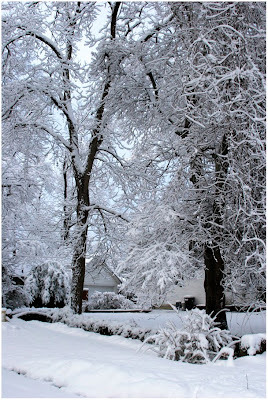 My front yard, earlier in the morning. 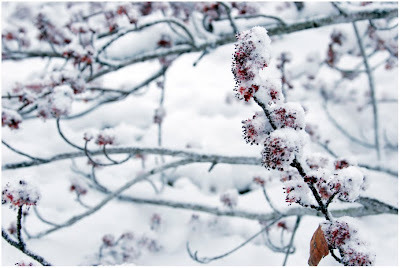 I'd awakened to snow the likes of which I haven't seen in years and was out the door at 6:30 in pjs and boots and a coat and a camera and I have a jillion pictures, even one of Lyndi-Linda in a bright pink robe and flipflops outside doing a bit of photo taking herself. It was still a bit dark and the streetlights glowed pink on the brick streets. leaving my front door wide open to the morning. A broken branch across the street. And, like I said, a jillion other images. There were snowmen here and there, even right next door, my neighbor having built him last night, but I admit my favorite was one I spotted on my way into work. I haven't stopped smiling all day. Love the pics. My favorite sight was a 50 something year old man, in front of his business, making a ginormious snowman, by himself in the middle of the day. Random groups of folks throwing snowballs in the Walgreens greenbelt and the sound of kids squeeling with glee next door at 8:00 this morning. yes the first one is as calming as a mantra. and beautiful, beautiful. I'm so happy to see you enjoying that gift from mother nature....sometimes she really is magical isn't she ? 'Morning! I've got pictures, too! 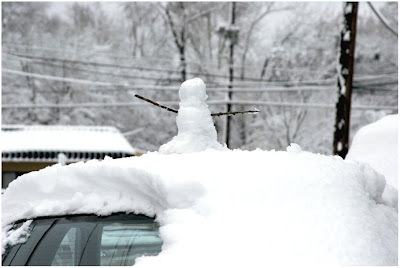 I saw little snowmen on several cars, and when I went through Southside Bank, one of the tellers had fashioned a little snowlady at her booth with a red hairbow! Very cute! I think I saw that man you talked about, and I saw another lady on Beckham making a big snowman out in the middle of a cleared lot! I did a lot of smiling yesterday, too! Once, when I lived in Rome, we had snow and I had the exact same reaction. Really brings out the inner child, doesn't it?! Wow what a really pink tinged picture, you lucky girl. I am in bed at 10.30pm the temp is probably close to 80deg and I have turned off the acir con to try and reduce my green footprint and have resorted to the fan, bring on the snow. Beautful stuff! Your first photo is amazing. 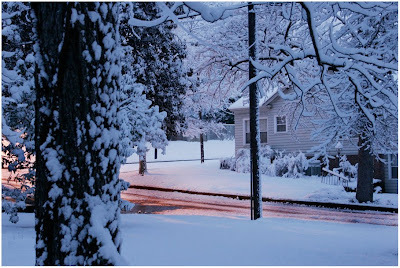 it was amazing...we lost power for 12 hours ..not fun but better than in the summer.your images are a delight! You make me smile too. Anyways, your photos looks wonderful. Feels am walking along in the beutiful wonderful wonderland. TY for sharing and happy heart's day. This is so cute! When you live in a place where snow is around for eight months(sometimes more!) 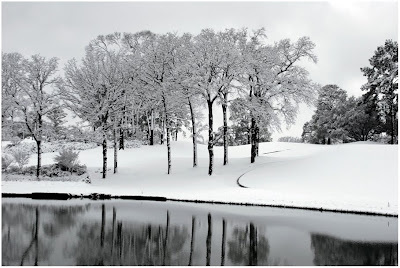 you forget that there are places that might actually delight in seeing snow. ...looks like you took full advantage of your "snow day". love the snowman on the car!! Hey, you. I am so, so far behind on my blog visiting. I haven't been by because I really do feel the need to sit and spend some time with you. I know, I'm a bit odd, but you are one of those bloggers that I need to give real time and attention to. I deserve it. So, here it is Valentine's Day and I had to stop by and wish you a great one. On this day, may you know, really know how much you are loved. May you recognize love in all it's forms. May you be grateful for the love of children and pets, old friendships and new. May you and EW Michael enjoy every minute together. May your heart swell with all the beauty this life brings. Happy Valentine's Day, my friend. Lucky you to wake up to such a surprise!!! Beautiful 'Texas' images!!! these are beautiful and capture the wonder and awe so nicely. I can certainly see why you haven't stopped smiling all day. What a glorious sight created by the beautiful snow. Loved seeing your images! I told you I'd be back. And here I am, grinning. *leaving my front door wide open to the morning* ... love that, and your first image..oh my goodness, how beautiful. That little snow man is looking for some adventure, me thinks. A little early morning car roof surfing?